Universal Pool, LLC specializes in high quality in-ground pool construction and builds swimming pools in Hickory, NC and the surrounding counties. Universal Pool has been serving the Unifour area since 1995. With over 20 years of experience in pool construction, we offer full-service, turn key pool solutions, including hardscaping. All work is completed and supervised directly by the Universal Pool builder - no crews are ever left unsupervised to complete the work! 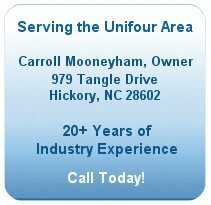 Universal Pool, LLC welcomes the opportunity to customize a pool that is tailored to your dreams. We have many reliable, highly-satisfied customers who are happy to be used as references. Please contact us for a consultation or for more information.